My lipstick collection is composed primarily of mattes. I just love how matte lipsticks last longer. Good brands also come up with long lasting types that go oh so well with my skin tone. It was only recently that I started loving the shiny moist types of lipstick. But for comfort and without the sticky feel, I’m still choosing a matte lipstick in a heartbeat. I was able to get the feel of Elianto Matte Berry last month and they glide smoothly on my lips. They currently have 5 deliciously chic shades, namely: Pink Berry, Red Berry, Cherry Berry, Deep Berry ad Tawny Berry. This line was formulated by beauty experts in Italy and is designed to last for only P359! Probably half the cost of the pricier brands in the market. 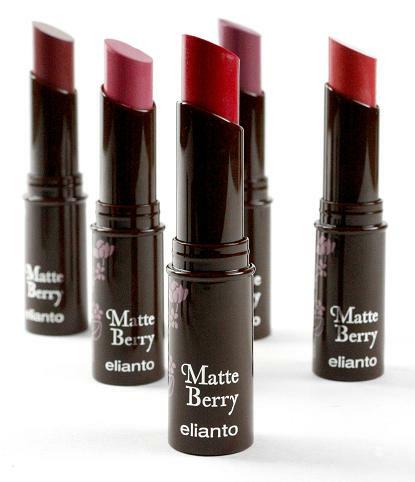 As with other Elianto products, these lipsticks are enriched with Vitamin E.
I want to purchase the matte berry lipsticks badly.will you ship worldwide?